OffersWizard is the PUP that uses misleading techniques to prevent removal. Use Reimage to locate malicious components and get rid of them faster than with uninstall instructions. A full system scan blocks virus reappearance and prevents traffic to malicious domains. Why should you remove OffersWizard from your computer? First of all, thousands of PC users have been infected with potentially unwanted programs and even malicious applications after visiting the main page of this malware. As we have mentioned, during the examination of 2spyware security experts, this page was pushing a fake Flash Player. The same can be said about its ads – beware that they can redirect you to a malicious website used for spreading adware-type programs, browser hijackers, and similar PUPs. In addition, this program can also track him/her behind his/hers back. In most of the cases, OffersWizard virus is interested in victim’s email address, PC’s location, its IP address, search terms, mostly visited websites and similar information. We highly recommend keeping this data private because it can easily be sold to third parties that are considered malicious. The most interesting fact about this adware is that it uses different names for trying to prevent its removal from the system. 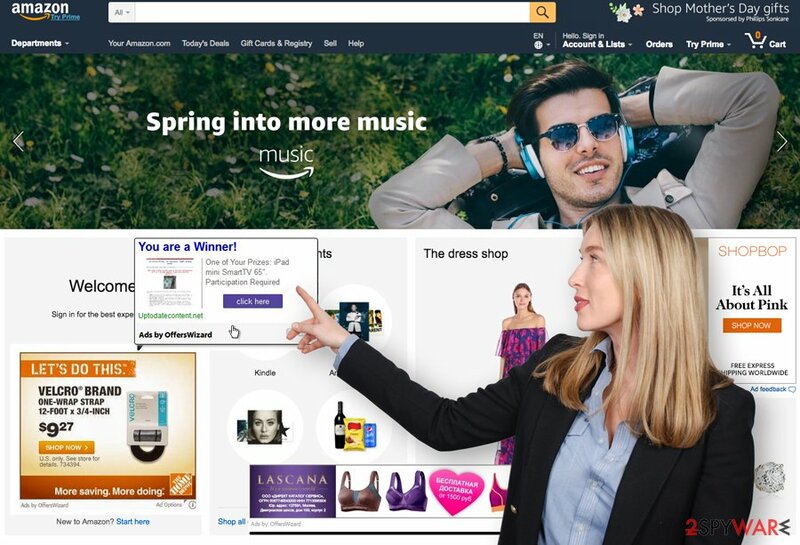 That’s why there are hundreds of PC users who have been convinced that they see its ads because they are injected into their favorite websites. In most of the cases, this adware hides under Network System Driver name. You should look for it in your Task Manager if ads by this program have been bothering you for a while. Please, do NOT click these pop-up notifications because they can lead you to malicious websites, such as the one that promotes the fake Flash. The safest way for OffersWizard removal is using automatic removal option. At the moment, we highly recommend using Reimage. You can download “Ads by OffersWizard” add-on and other dangerous components from the Internet. In most of the cases, users do that when they decide that they want to save some money. However, you may also notice redirects to suspicious websites right after entering its official website. Also, there is another method how this suspicious browser add-on can show up on your machine. It is known as bundling. If you want to prevent infiltration of this and similar viruses, you have to choose a Custom or Advanced installation method when installing freeware or shareware on your computer. Also, you have to find the check mark which allows installation of this browser extension on your PC system and deselect it. If you want to protect yourself from OffersWizard virus and avoid such unwanted activities as redirects, misleading pop-up ads, slow downs, and tracking, you should check the next page of this post and remove this adware from your computer. Please, select automatic removal method to remove the PUP and fix your computer without leaving related components on the system. You can remove OffersWizard from the system automatically by using programs that are recommended below. Keep in mind that visiting the official website of this program can cause the reappearance of the add-on. One of the main problems related to it is its capability to install additional malware on your computer. However, redirects to unknown websites, slow downs, browser crashes and similar problems should also be remembered when discussing this adware. If OffersWizard virus has been appearing on your computer for a while, it’s a sign that your machine is hijacked. Please, stay away from “deals” that are caused by it because you can never know what websites it started promoting. To uninstall this adware from your computer manually, you need to find these entries in your PC system: OffersWizard Software Version Updater, OffersWizard Network Filter Driver, etc. Here, look for OffersWizard or any other recently installed suspicious programs. Wait until you see Applications folder and look for OffersWizard or any other suspicious programs on it. Now right click on every of such entries and select Move to Trash. When in the new window, check Delete personal settings and select Reset again to complete OffersWizard removal. Once these steps are finished, OffersWizard should be removed from your Microsoft Edge browser. If your Firefox is hijacked by OffersWizard, you need to reset it to remove all components of this PUP. Here, select OffersWizard and other questionable plugins. Click Remove to delete these entries. Now you will see Reset Firefox to its default state message with Reset Firefox button. Click this button for several times and complete OffersWizard removal. To fix your web browser affected by this adware you need to reset it. This is the easiest way to get rid of unwanted add-ons. Here, select OffersWizard and other malicious plugins and select trash icon to delete these entries. Click Reset to confirm this action and complete OffersWizard removal. 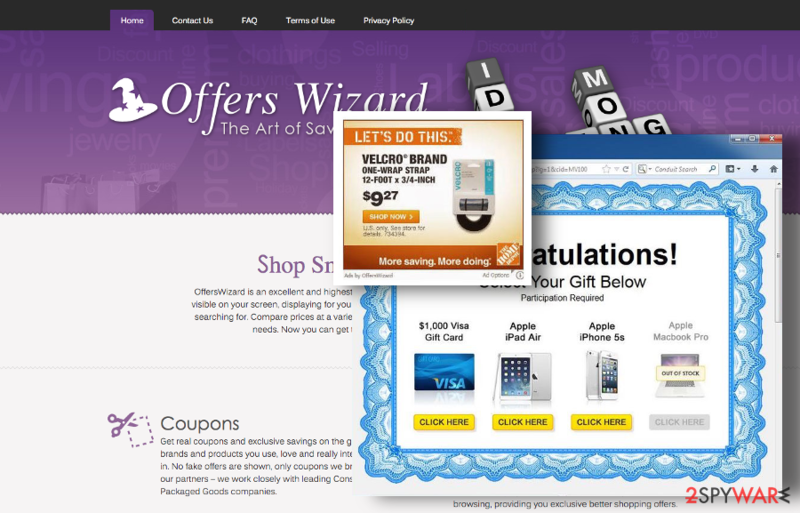 Here, select Extensions and look for OffersWizard or other suspicious entries. Click on the Uninstall button to get rid each of them. Now you will see a detailed dialog window filled with reset options. All of those options are usually checked, but you can specify which of them you want to reset. Click the Reset button to complete OffersWizard removal process. This entry was posted on 2017-04-21 at 04:27 and is filed under Adware, Viruses. You can quickly scan the QR code with your mobile device and have OffersWizard manual removal instructions right in your pocket. How did you remove OffersWizard?